Once in a while poutine, or poutine-like connotations appear elsewhere in the world... mainly the United States. 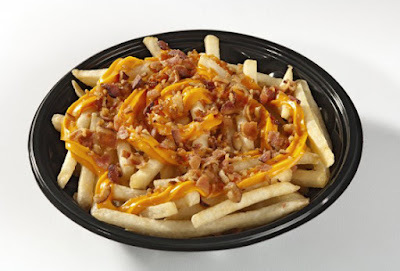 This time, Burger King has created a side dish called the Batata Suprema (Fries Supreme), which appears to contain cheddar cheese sauce, fries, and bits of bacon. However, there isn't any gravy, so this is considered mainly Bacon Cheese Fries. This was released late last year and was likely a limited time offer. To me, this makes me want to gag, but it could be a dish best served drunk.